GROUP DISCOUNT: $20/SEAT for parties of 8 or more. 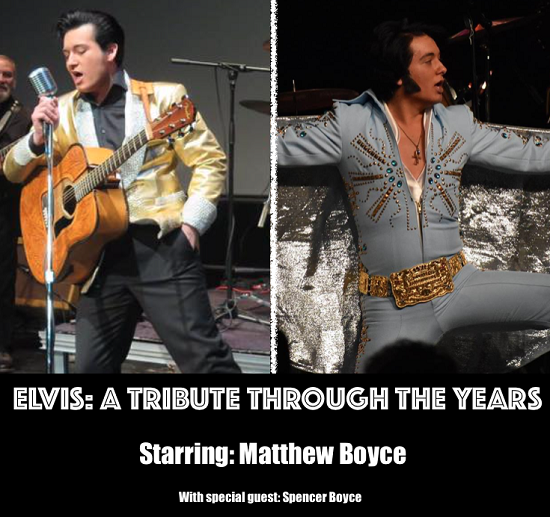 Take a musical journey through the career of Elvis Presley with award winning Elvis Tribute Artist, Matthew Boyce! Starting in the 1950s with The Ed Sullivan Show, you’ll travel through his early stage shows, movies, his ‘68 Comeback to the stage and of course his Vegas years! This two act musical review will keep your eyes glued to the stage at every moment! This show also features a special guest; the 2017 Images of the King YOUTH WORLD CHAMPION, Spencer Boyce. Backed by the Suspicious Minds Tribute Band, this is one show not to miss! Matthew Boyce has been an ETA for over 12 years. Since his start, he’s been blessed to have taken his show all across the US and Canada. He’s a five time grand champion in Ontario, Canada as well as sporting numerous accolades from across the US. He is honored to be coming back to The Regent Theatre after the great success of On Tour: A Tribute to the King concert in the fall of 2018.